Find out why these stocks have soared and whether they have further to climb. The stock market has climbed to new all-time highs in the past month, extending the bull market well into its eighth year. Yet even though major market benchmarks have struggled to achieve even 10% returns, some stocks have done far better. 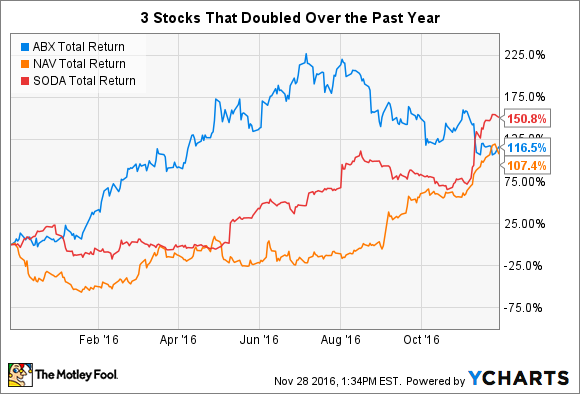 In particular, a few select stocks have managed to double in the past year. Below, we'll look more closely at Barrick Gold (NYSE:GOLD), Navistar (NYSE:NAV), and SodaStream (NASDAQ:SODA) to see what's behind their gains and whether investors should expect any further upward moves in the future. The precious metals arena has done well over the past year, pulling out of the slump throughout the commodities markets from previous years. After having traded below $1,100 per ounce this time last year, gold climbed above $1,350 briefly during the summer, and Barrick Gold has taken full advantage of the recovery in precious metals to boost its profits and post impressive share-price gains of 116%. One reason why Barrick has responded so strongly is that it has more exposure to the price of gold than some of its mining industry peers. With a highly leveraged balance sheet, Barrick needs strong gold prices in order to keep up with its debt and maintain liquidity. The gold market certainly obliged the company early in 2016. Yet recent declines in gold have taken their toll, eating into Barrick's returns. Looking ahead, the gold miner will need to see the yellow metal's prospects bounce back if it wants to hold onto the gains that the stock has managed to achieve over the past year. Unlike the gold market, trucking has been a difficult sector for the economy. As a major provider of trucks and components for the transportation sector, Navistar saw its stock plunge in 2015. However, Navistar started to bounce back early in 2016 as industry conditions appeared to improve. More importantly, Navistar shares soared when German auto giant Volkswagen announced that it would invest more than $250 million in Navistar stock. The deal gave Volkswagen a one-sixth stake in Navistar, and the German company will have the right to appoint two members of the Navistar board of directors going forward. Many investors see the partnership as being extremely valuable for Navistar, especially because a key diesel truck engine that Navistar tried to have approved by the EPA several years ago failed to do so. With Volkswagen being able to supply engines, Navistar sees considerable savings, and the partnership could eventually blossom into a full-blown takeover if things go well. Finally, carbonated beverage-machine maker SodaStream has rebounded sharply from past losses. The stock has climbed more than 150% over the past year, as the company managed to find a new strategic direction that has given it considerably better results. The company experienced only mixed success billing itself as a home soda-making business, especially given the negative perception of sugary soft drinks in the broader beverage industry. In response, SodaStream decided to recast itself as a sparkling water company, with customers using its beverage-makers to carbonate water rather than adding syrup. In response, earnings in its most recent quarter tripled from year-ago levels, and sales of carbon-dioxide tanks and starter kits helped offset the decline in flavoring units. With the trend away from soda having been firmly established throughout the industry, SodaStream's move appears to be the best chance for its long-term survival, and the company's early results after the strategic decision look extremely promising. You can't count on stocks doubling every year, and these companies have already seen big moves higher. Rising rates could keep gold low and prevent Barrick from posting further gains, and Navistar has already gotten a big boost from the Volkswagen partnership and full takeover speculation. For SodaStream, however, a strong holiday season could send the stock back upward to new heights.